One of my favorite things about extended beading challenges is the opportunity to try out new things, and rotate some of the materials in my bead stash. What better time is there to finally get around to using beads that have just been hanging around? This week I decided to tackle a packet of pink fire polish beads that I had purchased earlier this year. I picked them up because they so closely resembled the 2011 It color, Honeysuckle. Then I put them away and basically forgot all about them. To make sure that I could use as many of the beads as possible - hopefully all of them at once - I wanted a bracelet design that could hold a lot of accent beads. I started by choosing a base color, and the first thing that caught my eye was colonial gray lined crystal. They have a shimmer that matches the finish on the fire polish perfectly. Plus gray and pink always look fabulous together. Next I had to decide on a technique that would allow both beads lots of room to play. I finally decided on openwork right angle weave, with the fire polish stitched in at the end. I knew that I wouldn’t be able to get the width that I wanted, and be able to cover the entire cuff with pink accents, but I went ahead anyway, hoping that the right pattern would come to mind as I worked. When it came time to add the fire polish, I had no idea what I was going to do. I thought about doing a random network of columns, but I didn’t like the uncertainty. Instead, I decided to make some pyramids. The pattern turned out great, and there were only a few fire polish left over. I love the look of the raised pink triangles, and recessed gray ones. I wonder what other inspirations are now lurking in the bead cupboard? Wow, that is really cool. Love fire polished beads. You were right, they go with the lined seed beads perfectly. Love the pyramid idea. I would have never thought of that. What a great idea!!!! Would love to see a photo a little farther away to see the whole pattern! Mortira, how do you get you RAW with 2 beads in each wall so square? When ever I try with 2 beads the outside sides end up angled? With square openwork RAW, there's always a bit of roundness to the outer edge, because there's nothing to pull the rows into place. Extra thread passes can help a little - it makes the loose rows a little stiffer. If you want absolutely straight edges, you can reinforce them by adding a single bead between each unit. If you weave round a full square every few units, it can help prevent a curve in the beadwork as the thread is cinched up. I hope that makes sense. Maybe I'll add this to my tutorial queue! So so pretty & what a clever design. I, too, would love to see another photo that shows more or shows it a farther away, please!! I knew you could do RAW like this. Thanks for the info! What a unique color pairing! I love the pyramid design, too. Beautiful and a great design! Thanks everyone! As requested, I've switched to a full-view image. The triangle pattern is almost perfect - it's too bad the overlap doesn't quite match up. WOW! Thank you for the photo. It's an awesome bracelet and this shows it even better. Love it. Yes those raised pink triangles are stunning and I love the layout! 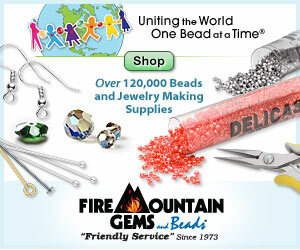 I have a love of firepolished beads too!